On April 4, 2004, the 2-5 battalion of the 1st Cavalry Division was just taking over responsibility for Sadr City, a large Baghdad slum with a population of 2 million. A platoon of 18 soldiers and their interpreter was returning to its base from the most routine of missions, providing security for sewage trucks, when it suddenly came under fire. Within minutes, a gunner, Sgt. Eddie Chen, was fatally injured. Others were wounded and two of the platoon’s four Humvees were disabled. Lt. Shane Aguero, the platoon leader, directed the team down an alleyway, where the soldiers took cover in a house. Back at the battalion’s base, Camp War Eagle, located just outside Sadr City, the new commander, Lt. Col. Gary Volesky, was taking over command as radio reports came in from the platoon detailing the increasing intensity of the fight. Then reports arrived of enemy fighters seizing the local police stations in the neighborhood. Volesky and rescue teams from the battalion’s Charlie and Alpha Company raced into the city, facing an onslaught of gun fire, rocket propelled grenades (RPGs) and pipe bombs. By the end of the night, eight soldiers would be dead and more than 60 wounded -- the largest casualty count in one day for the First Cavalry Division since Vietnam. 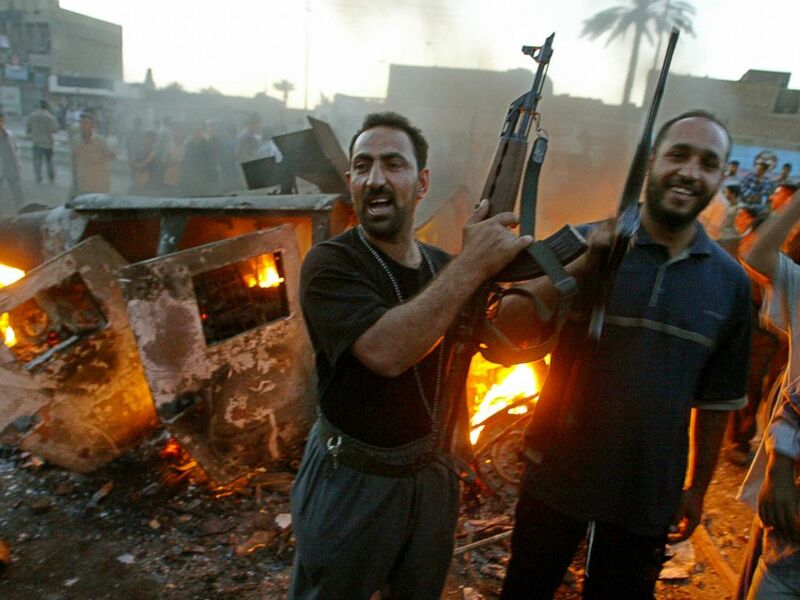 Armed Iraqi Muslim Shiites, member of Shiite radical leader Moqtada al-Sadr Army of Mehdi militia jubilate near a burning US Army Humvee during clashes in Baghdad's al-Sadr City district, April 4, 2004. 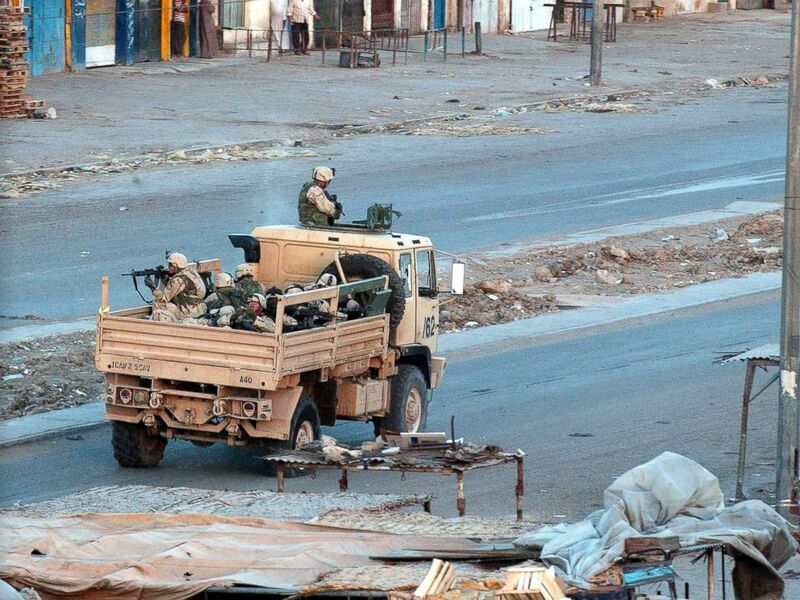 More than a year after the U.S. invasion of Iraq and the toppling of Saddam Hussein, American forces still faced violence across the country, but Sadr City had been relatively calm. In the previous six months, only one U.S. soldier had been killed. The population, predominantly Shia, had suffered under the Sunni leadership of Saddam Hussein, and the incoming 2-5 battalion was anticipating a reconstruction and peace keeping mission. But a young militant Shia cleric, Moqtada al Sadr, had other plans. The son of a powerful and popular Shia leader who was assassinated during Hussein’s rule, he fiercely opposed the American occupation. Drawing on the continuing instability, rampant unemployment and poverty still plaguing Shia communities, al Sadr was stirring up resentment across the country. In the days ahead of April 4, his followers had been protesting in the thousands in Baghdad and other areas. The final straw came when the U.S.-led coalition shut down a popular newspaper and arrested a close ally. As the 2-5 Cav took over control, al Sadr unleashed his militia – the thousands-strong Mahdi Army – not just in Sadr City, but across Baghdad and in other cities. How was the platoon rescued? Back at the house in the alley, with an Iraqi family still inside, soldiers from the platoon took up positions on the roof. Sgt. 1st Class Jerry Swope stayed down in the alley in one of the remaining Humvees. As enemy fighters continuously assaulted the platoon, Swope was on the Humvee’s radio for the entire fight, the only point of contact with rescue teams struggling to get to them. Up on the roof, the soldiers were frantically trying to signal their location, using smoke grenades, electronic signaling equipment, even ripping off the sleeves of their uniforms to start a fire. Out on the streets of Sadr City, the multiple rescue teams attempting to reach the pinned down platoon came under fierce attack and incurred heavy casualties. Charlie Company passed by the alleyway, but with the antennas shot off the lead Bradley fighting vehicles, the Bradleys were unable to hear the radio calls to stop. Eventually, a tank company came up the adjoining road. Watching the tanks rolling by, SFC Swope frantically called into the radio for them to stop. The platoon leader, Lt. Aguero, in a last-ditch effort, ran down the alley waving his flashlight in the dark. The tank company commander saw the light, and stopped, bringing the power and might needed to push back the enemy fighters and get the platoon out. In addition to Sgt. Eddie Chen, the gunner with the pinned-down platoon, seven other soldiers were killed that evening: Spc. Robert Arsiaga, Spc. Ahmed Cason, Spc. Israel Garza, Spc. Stephen Hiller, Cpl. Forest Jostes, Sgt. Michael Mitchell and Spc. Casey Sheehan. Most of them were in their 20s. More than 60 others were wounded. The fight to rescue the team in the alley was just the beginning. Within hours, many of the soldiers involved were back battling on the streets of Sadr City to retake the police stations that had been seized. They would go on to fight this new insurgency for 80 straight days, and then after a brief respite, would endure another 60. As Volesky put it, “Uncommon valor was common that day.” Sgt. 1st Class Swope would be awarded a Silver Star for staying in the Humvee in the alley and remaining on the radio for the entire battle. Staff Sgt. Robert Miltenberger was also awarded the third-highest medal for valor because of his actions that night. As part of a rescue mission, he and more than a dozen other soldiers were in the rear of an open-bed LMTV truck. Exposed to the enemy like the proverbial fish in a barrel, Miltenberger was credited with saving the lives of three soldiers while treating many other wounded. U.S. troops patrol the deserted streets of the sprawling Shia slum of Sadr City at sunset after a day of tense clashes across the country with supporters of controversial Shia cleric Moqtada al-Sadr, April 4, 2004, in Sadr City, Iraq. For soldiers of the 2-5 battalion, it was moment that would define the days to follow.